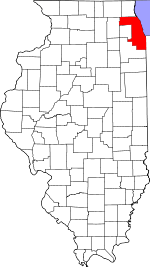 Location in Cook County and the state of Illinois. Evanston /ˈɛvənˌstən/ is a city in Cook County, Illinois, United States, 12 miles (19 km) north of downtown Chicago, bordered by Chicago to the south, Skokie to the west, and Wilmette to the north, with a population of 74,486 as of 2010. It is one of the North Shore communities that adjoin Lake Michigan and is the home of Northwestern University. The boundaries of the city of Evanston are coterminous with those of the former Evanston Township, which was dissolved in 2014 by voters with its functions being absorbed by the city of Evanston. In 1851, a group of Methodist business leaders founded Northwestern University and Garrett Biblical Institute. They chose a bluffed and wooded site along the lake as Northwestern's home, purchasing several hundred acres of land from Dr. John Foster, a Chicago farm owner. In 1854, the founders of Northwestern submitted to the county judge their plans for a city to be named Evanston after John Evans, one of their leaders. In 1857, the request was granted. The township of Evanston was split off from Ridgeville Township; at approximately the same time, that portion of Ridgeville south of Devon Avenue was organized as Lake View Township. The nine founders, including John Evans, Orrington Lunt, and Andrew Brown, hoped their university would attain high standards of intellectual excellence. Today these hopes have been fulfilled, as Northwestern consistently ranks with the best of the nation's universities. During the 1960s, Northwestern University changed the city's shoreline by adding a 74-acre (30 ha) lakefill. In 1939, Evanston hosted the first NCAA basketball championship final at Northwestern University's Patten Gymnasium. In August 1954, Evanston hosted the second assembly of the World Council of Churches, still the only WCC assembly to have been held in the United States. President Dwight Eisenhower welcomed the delegates, and Dag Hammarskjöld, secretary-general of the United Nations, delivered an important address entitled "An instrument of faith". Evanston first received power in April 1893. Many people lined the streets on Emerson St. where the first appearance of street lights were lined and turned on. Today, the city is home to Northwestern University, Music Institute of Chicago, and other educational institutions, as well as headquarters of Alpha Phi International women's fraternity, Rotary International, the National Merit Scholarship Corporation, the National Lekotek Center, the Sigma Alpha Epsilon fraternity, the Sigma Chi Fraternity and the Woman's Christian Temperance Union. According to the 2010 census, Evanston has a total area of 7.802 square miles (20.21 km2), of which 7.78 square miles (20.15 km2) (or 99.72%) is land and 0.022 square miles (0.06 km2) (or 0.28%) is water. As of the census of 2010, there were 74,486 people (up from 74,239 at the 2000 census), 30,047 households, and 15,621 families residing in the city. The population density was 9,574.0 people per square mile (3,687.4/km²). There were 33,181 housing units at an average density of 4,264.9 per square mile (1,642.6/km²). The 2010 census showed that Evanston is ethnically mixed with the following breakdown in population: 65.6% White, 18.1% Black or African American, 0.2% American Indian or Alaska Native, 8.6% Asian, 0.02% Native Hawaiian or other Pacific Islander, 3.6% some other race, and 3.8% from two or more races. 9.0% were Hispanic or Latino of any race. There were 30,047 households, out of which 26.1% had children under the age of 18 living with them, 39.8% were headed by married couples living together, 9.7% had a female householder with no husband present, and 48.0% were non-families. 37.5% of all households were made up of individuals, and 10.5% were someone living alone who was 65 years of age or older. The average household size was 2.25, and the average family size was 3.05. The median age was 34.3 years, with 19.3% under the age of 18, 16.8% from 18 to 24, 27.8% from 25 to 44, 24.0% from 45 to 64, and 12.2% who were 65 years of age or older. For every 100 females there were 91.0 males. For every 100 females age 18 and over, there were 88.0 males. As of 2011, the estimated median income for a household in the city was $60,033, and the median income for a family was $102,706. Male full-time workers had a median income of $66,106 versus $52,727 for females. The per capita income for the city was $40,732. About 6.4% of families and 12.1% of the population were below the poverty line, including 14.1% of those under age 18 and 6.5% of those age 65 or over. 12.3% of Evanston's 9,259 businesses are Black owned. Evanston has a council-manager system of government and is divided into nine wards, each of which is represented by an Alderman, or member of the Evanston City Council. As of 2014, the mayor is Elizabeth Tisdahl, replacing longtime mayor Lorraine H. Morton. In the April 2009, municipal elections, Ald. Elizabeth Tisdahl won a landslide victory in the race for mayor over three opponents in a low-turnout election. Evanston was heavily Republican in voter identification from the time of the Civil War up to the 1960s. Nixon carried Evanston in the 1968 presidential election. The city began trending Democratic and now almost exclusively identifies with candidates affiliated with the Democratic Party in elections on all levels of government. In the 2004 presidential election, Democratic candidate John Kerry won 82% of Evanston's vote. His Republican opponent and the nationwide winner, President George W. Bush, only won 17% of the vote in Evanston. In 2008, Democrat Barack Obama won approximately 87% of the vote in Evanston over Republican Senator John McCain. Early after its founding, because of its strong Methodist influence, and its attempt to impose moral rigor, Evanston was called "Heavenston". In the early 20th century Evanston was called "The City of Churches". The varied works of numerous prominent architects, and many prominent mansions, especially near the lakefront, gave the town by the 1920s the sobriquet "The City of Homes", a fact often touted by local real estate agents. Use of the phrase has been attributed to a 1924 speech at the local Kiwanis club. Since the late 20th century, because of Evanston's activism and often left-of-center politics, it is sometimes humorously (or sarcastically) referred to as "The People's Republic of Evanston". 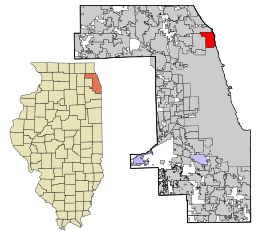 The eastern border of the adjacent village of Skokie that falls within Evanston township schools and 60203 zip code is called "Skevanston", a portmanteau of both names. Most of Evanston (and a small part of the village of Skokie) is within the boundaries of Evanston Township High School District 202. The school district has a single high school, Evanston Township High School, with an enrollment of just over 3,500, covering grades 9 through 12. Evanston-Skokie Community Consolidated School District 65, covering all of Evanston and a small part of Skokie, provides primary education from pre-kindergarten through grade 8. The district has ten elementary schools (kindergarten through fifth grade), three middle schools (grades 6 through 8), two magnet schools (K through 8), two special schools or centers, and an early childhood school. Dr. Paul Goren is the Superintendent of Schools. Pope John XXIII School, a Catholic school serving children pre-kindergarten through eighth grade. The school dates back to 1886 with the establishment of separate schools serving St. Nicholas and St. Mary's parishes in Evanston. The original St. Nicholas School was in the building now called the Annex. The main school building was built in 1954. In 1986 the two parish schools consolidated and the new school was renamed Pope John XXIII School. The Evanston Public Library was established in 1873, and has three branches as of 2013. Evanston's growth occurred largely because of its accessibility from Chicago by rail. The Northwestern founders did not finalize their commitment to siting the university there until they were assured the Chicago & Milwaukee Railway line would run there. C&M trains began stopping in Evanston in 1855. Evanston later experienced rapid growth as one of the first streetcar suburbs. The North Shore Line which gave the area its nickname started at Church Street in Evanston and continued up to Waukegan. The city is still connected to Chicago by rail transit. The CTA's Purple Line, part of the Chicago 'L' system, runs through Evanston. From its terminal at Howard in Chicago, the line heads north to the South Boulevard, Main, Dempster, Davis, Foster, Noyes, and Central stations, before terminating at the Linden station in Wilmette, Illinois. Metra's Union Pacific/North Line also serves Evanston, with stations at Main Street, Davis Street and Central Street, the first two being adjacent to Purple Line stations. The CTA's Yellow Line also runs through the city, though it does not stop there. Evanston is served by six CTA bus routes as well as four Pace bus routes. Active modes of transportation include miles of sidewalks and bicycle lanes. The largest automobile routes from Chicago to Evanston include Lake Shore Drive, the Edens Expressway (I-94), and McCormick Boulevard, although the first two of those do not extend to Evanston itself and require driving through Rogers Park (via Sheridan Road or Ridge Avenue) and Skokie, respectively. The main routes from the north are the Edens, Green Bay Road, and Sheridan Road. Downtown - centered around the Davis Street Metra and "L" stops, Evanston's downtown adjoins Northwestern University. There are over 300 businesses, several highrise office and residential buildings, three traditional low-rise shopping areas, an 18-screen movie theatre, and over 85 restaurants. It is roughly bordered by Emerson Street to the north, Dempster Street to the south, Ridge Avenue to the west, and the Lake to the east. Central Street - actually several shopping districts linked along the northernmost of the city's principal east-west arteries, with the most active clustered around the Central Street Metra station and characterized by specialty shops and restaurants in a walkable environment with an eclectic, vintage "small-town feel" strongly protected by the community. Dempster Street - just off the Dempster "L" stop; over 60 shops, many of them small and hip, including Bagel Art, the vegetarian Blind Faith Cafe, The Mexican Shop, 2nd Hand Tunes, lollie (children's boutique), FolkWorks Gallery, Union Pizzeria and SPACE, a music venue and recording studio. Main Street Station - approximately 3 blocks of mostly independent boutiques and restaurants abutting both a CTA and Metra stop, in a gentrifying neighborhood. Since 1917, the neighborhood has been home to the South Branch of the Evanston Public Library. After the original branch closed in February 2011 due to budgetary concerns, the Chicago Ave./Main St. Branch was opened down the street in January 2013, replacing an interim volunteer library that had been operated in that location by the Evanston Public Library Friends. The neighborhood is also home to the Evanston Arts Depot. Howard Street - many small shops line the city's border with Chicago; at the west end of the avenue, near the border with Skokie, Howard Center, a small thriving shopping mall, was built in the 1990s after some controversy. Chicago Avenue - not a separate shopping district per se, this extension of what is called Clark Street in Chicago runs parallel to the rail lines and is the principal north-south artery in Evanston from Howard Street north to its terminus at Northwestern University. Chicago Avenue connects the Main Street, Dempster Street, and Downtown shopping districts with a mix of small independent businesses and chains, including a busy cluster of supermarkets near its intersection with Dempster. Once home to a great number of auto dealerships, it has attracted numerous restaurants and a growing number of multi-unit residential structures. First Bank & Trust, an independent community and commercial financial institution, is headquartered in Evanston with four locations around the city. Magnetar Capital, a hedge fund based in Evanston, was ranked #4 among hedge funds worldwide by Institutional Investor/Alpha magazine in 2015. A perennial debate in Evanston is the issue of Northwestern University's status as a tax-exempt institution. In the founding charter of Northwestern University, signed in 1851, the state granted the school an exemption from paying property taxes, and unlike other well-off private universities with statutory exemptions, it provides its own police services, but not firefighter/paramedic services. It pays water, sewer, communications, real property transfer taxes, and building permit fees, but not property taxes. Northwestern does not make Payments in Lieu of Taxes for the real estate it removes from property tax rolls. Northwestern's critics allege that it consumes far more from the city than it contributes. However, its backers, like former Evanston mayor and Northwestern alumna Lorraine H. Morton, contend that the benefits of having an elite research institution justify Northwestern's tax status. These supporters highlight the fact that Northwestern University is the largest employer in Evanston, and that its students and faculty constitute a large consumer base for Evanston businesses. This controversy was revived in 2003 when the university purchased an eight-story office building downtown, removing it from the tax rolls. An advisory referendum put on the April elections ballot, dubbed by supporters as a "Fair Share Initiative", received a majority, but was not passed into ordinance by the City Council. In September 2009, Northwestern purchased a fire truck for the city of Evanston at a cost of $550,000. Northwestern President Morton Schapiro stated, "We are pleased to fund the purchase of this new fire engine, which was the top priority of the City in our discussions with how we might assist the City financially." Evanston Now, an online newspaper and community website. Evanston's variety of housing and commercial districts, combined with easy access to Chicago, make it a popular filming location. Evanston as of December 2008 is listed as a filming location for 65 different films, notably those of John Hughes. Much of the 1984 film Sixteen Candles was filmed in and around Evanston, as was the 1993 film Dennis the Menace, and the 1997 film Home Alone 3. A number of scenes from the 1986 Garry Marshall film Nothing in Common were filmed on the Northwestern University campus and Evanston's lakeshore. Although not filmed there, the 2004 film Mean Girls is set in the Evanston suburbs, and makes several references to the area. In the 2003 film Cheaper by the Dozen, the family moves to Evanston. Additionally, the baseball movie Rookie of the Year, featuring Gary Busey and Thomas Ian Nicholas, was partially shot at Haven Middle School. In The Princess Bride, according to IMDB, the screenplay says that the boy and his grandfather live in Evanston. This was also stated by Mandy Patinkin in a behind-the-scenes interview. The story's author, William Goldman, was born in Chicago and grew up in Highland Park just a couple of miles away from Evanston. Evanston has gained recognition and reputation for efforts related to sustainability, including those by government, citizens, and institutions. In 2015, the city was named the World Wildlife Fund's Earth Hour Capital after competing against cities including Seattle and Cleveland. In 2016, Evanston was again a finalist in the competition. In October 2006, the city voted to sign the United States Conference of Mayors Climate Protection Agreement, and a number of citizen task forces convened to develop a plan to reduce the city's carbon footprint. The Evanston Climate Action Plan ("ECAP"), accepted by the City Council in November 2008, suggested over 200 strategies to make Evanston more sustainable, principally by reducing carbon emissions associated with transportation, buildings, energy sources, waste, and food production. In June 2011, the United States Conference of Mayors awarded Evanston first place in the small city category of the Mayors' Climate Protection Awards, based largely on the city's use of the ECAP, which the city asserts has reduced emissions by 24,000 metric tons per year. On September 15, 2011, Wal-Mart presented Mayor Tisdahl with a $15,000 award in recognition of the honor, which the mayor donated to Citizens' Greener Evanston. An Evanston Strategic Plan passed on March 27, 2006, aspired to create the most livable city in America and to promote the highest quality of life for all residents. One goal is to create and maintain functionally appropriate, sustainable, accessible high quality infrastructure and facilities. This includes continual development of an environmentally sensitive lakefront and implementation of a comprehensive long-range infrastructure plan. Another goal is to protect the city's natural resources and to build environment, not destroy it. The city also wants to improve its transportation resources to be more safe, integrated, accessible, responsive, and energy-efficient. Evanston has an environment board and an office of sustainability. The single largest carbon-reducing strategy identified in the ECAP, the development of an offshore wind farm in Lake Michigan, gained widespread attention. In April 2010, Evanston's City Council voted to authorize issuing a Request for Information (RFI) so that interested parties could provide information on developing a wind energy facility 4 miles (6 km) off the coast of Lake Michigan. Following the receipt of responses, the Mayor appointed a committee to evaluate the information received. The committee's report was accepted in spring 2011, and the City Council voted to move forward with exploration of the concept. In the meantime, Evanston legislators introduced legislation, signed into law in summer 2011, creating a state offshore wind council to propose how to regulate possible development of such projects. Northwestern University's Ford Engineering Design Center is a LEED Silver certified building, and the Jewish Reconstructionist Congregation has built a LEED Platinum certified synagogue. Not-for-profit groups active on environmental issues include Citizens' Greener Evanston, an outgrowth of the hundreds of citizens who participated in the creation of the Climate Action Plan, the Business Alliance for a Sustainable Evanston, a coalition of local businesses committed to advancing environmental sustainability and economic progress in Evanston's commercial sector, The Talking Farm, an organization devoted to sustainable urban farming, and the Evanston Environmental Association, who organizes an annual "Green Living Festival" and other events. ↑ "Fiscal Year 2016 Adopted Budget" (PDF). City of Evanston. January 1, 2016. Retrieved 24 September 2016. 1 2 "Selected Economic Characteristics: 2011 American Community Survey 1-Year Estimates (DP03): Evanston city, Illinois". U.S. Census Bureau, American Factfinder. Retrieved February 11, 2013. ↑ "Selected Housing Characteristics: 2011 American Community Survey 1-Year Estimates (DP03): Evanston city, Illinois". U.S. Census Bureau, American Factfinder. Retrieved February 11, 2013. 1 2 3 4 5 "Profile of General Population and Housing Characteristics: 2010 Demographic Profile Data (DP-1): Evanston city, Illinois". U.S. Census Bureau, American Factfinder. Retrieved February 11, 2013. ↑ Illinois State Historical Society; Currey, Seymour (1909). "Chicago's North Shore". Transactions of the Illinois State Historical Society for the year 1908. Springfield, Illinois: Illinois State Historical Library. pp. 101–109. Retrieved August 26, 2010. ↑ Gannett, Henry (1905). The Origin of Certain Place Names in the United States. Govt. Print. Off. p. 122. ↑ City of Evanston. "City of Evanston - About Evanston - History". Retrieved December 13, 2008. ↑ Newton Bateman & Paul Selby, ed. (1917). "Evanston". Historical Encyclopedia of Illinois. 1. Chicago: Munsell Publishing Co. p. 160. Retrieved December 14, 2008. ↑ "The James Roscoe Miller Campus". Retrieved February 23, 2013. ↑ Hjelm, Norman A. (September 14, 2004). "Evanston After Fifty Years". World Council of Churches. Retrieved December 18, 2008. ↑ "Clayton Mark Products Used Throughout the World". Evansbriar Review. May 7, 1953. ↑ Foerstner, Abigail. "Evanston liquor store to close door on era." Chicago Tribune. July 6, 1984. p. NS-1. ↑ "Evanston (city) QuickFacts from the US Census Bureau". quickfacts.census.gov. Retrieved 2016-03-01. ↑ Hughes, Jim (April 8, 2009). "Evanston Election Results April 7, 2009 / Central Street Neighbors Association". Retrieved April 8, 2009. ↑ "Affluent Settled Evanston, Illinois". Time. March 15, 1971. Retrieved September 18, 2011. ↑ "Suburban Cook County Election Results November 04, 2008 Presidential General Election". Cook County Clerk's Office. Retrieved 20 January 2016. 1 2 "A Brief History of Evanston". Evanston Public Library. Retrieved January 8, 2009. 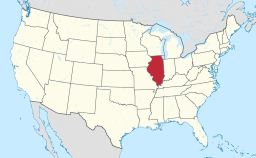 ↑ "Evanston, Ill.". The Encyclopedia Americana. X. 1918. p. 593. Retrieved January 8, 2009. It is really a residential suburb of Chicago, and called "City of Churches." ↑ Green, Caryn (January 2009). "Welcome to Heavenston". North Shore Magazine. Retrieved January 8, 2009. ↑ e.g., "Evanston Real Estate - Evanston MLS". Baird & Warner. 2007. Retrieved January 8, 2009. ↑ "Evanston CM" (PDF). City of Evanston (advertisement for City Manager). January 2009. Retrieved January 8, 2009. ↑ Reed, Robert (November 26, 2008). "Surprise! This Bank Refuses Fed Bailout". Huffington Post. ↑ Traffic Guy (June 11, 2008). "The Traffic Guy Hears". Evanston Roundtable. Archived from the original on December 12, 2008. Retrieved January 8, 2009. ↑ "CSNA Mayoral Forum Q. #9 (gentrification) & Q.10 (People's Republic of Evanston) / Central Street Neighbors Association". March 23, 2009. Retrieved March 26, 2009. ↑ "Pope John XXIII School - Our History". Pope John XXIII School. Retrieved April 4, 2014. ↑ Fisher, Jennifer (January 24, 2013). "Library Branch Returns to South Evanston". EvanstonPatch. Retrieved June 10, 2013. ↑ "History of Northwestern University Library". Northwestern University Library. March 3, 2001. Retrieved December 14, 2008. ↑ "City of Evanston - Major Employers in Evanston" (PDF). ↑ Newman, Scott A. (May 11, 2006). "Jazz Age Chicago--Marshall Field & Co.". Retrieved December 13, 2008. ↑ "Evanston Galleria - Building History". Retrieved December 14, 2008. ↑ "About Central Street - Central Street Neighbors Association". Retrieved December 13, 2008. ↑ "Central Street Business Association - Home". Retrieved December 13, 2008. ↑ Hartong, Jason (June 11, 2008). "Evanston's Central Street". Chicago North Shore Home & Beyond. Retrieved December 13, 2008. ↑ "Our Evanston- Green Bay Road Office". Koenig & Strey. Retrieved December 13, 2008. ↑ The Lakota Group (April 12, 2007). "Central Street Master Plan Council Handout April 12, 2007" (PDF). City of Evanston. Archived from the original (PDF) on March 25, 2009. Retrieved December 13, 2008. ↑ "Chicago/Dempster Merchants Association". Retrieved December 16, 2008. ↑ Aeh, Kevin (July 9, 2008). "3.6 hours in Evanston". Time Out Chicago. Retrieved December 16, 2008. ↑ "Main Street Station - Evanston with a Heart". Carfree Chicago. Retrieved June 10, 2013. ↑ Duffer, Robert (February 24, 2010). "Book place: Evanston public library south branch". Chicago Tribune. Retrieved September 6, 2010. ↑ "South Branch". Evanston Public Library. Retrieved September 6, 2010. ↑ "Library Branch Returns to South Evanston". Evanston Patch. Retrieved June 10, 2013. ↑ "Evanston Arts Depot - Cultural Arts Center". 2006. Retrieved December 13, 2008. ↑ Mathieu, Marc J. "Evanston Divide: The Short Life of 'Bernie's Wall'". Chicago Reporter. Retrieved December 13, 2008. ↑ Taub, Stephen. "The Hedge Fund Report Card" (PDF). Institutional Investor's Alpha. ↑ "Harvard Will Pay More To Cambridge in Accord". The New York Times. November 28, 1990. Retrieved May 2, 2010. ↑ Allen, J Linn (October 22, 2000). "Nu Celebrates Landmark Birthday". Chicago Tribune. ↑ "Northwestern Purchases Fire Truck for Evanston". Northwestern University News. Northwestern.edu. September 23, 2009. Retrieved July 14, 2013. ↑ "Titles with locations including Evanston, Illinois, USA". IMDb. Retrieved December 13, 2008. ↑ "Sixteen Candles (1984)". Retrieved December 14, 2008. ↑ IMDB quote: "While never stated in the movie, according to the screenplay the grandson and grandfather live in the Chicago suburb of Evanston, Illinois. This explains the Walter Payton Chicago Bears #34 jersey worn by the grandson, the Chicago Cubs pennant and William Perry poster on the wall and the Chicago White Sox cap hanging in the room." ↑ Mandy Patinkin interview, quote: "It's about a little boy who's sick at home in Evanston, Illinois and his grandfather comes over to read him a book to tell him that the most important thing in life is true love." ↑ "Evanston Selected as US Earth Hour City Challenge Finalist for Second Straight Year". City of Evanston. 25 May 2016. Retrieved 24 September 2016. ↑ "Mayors Climate Protection Center". United States Conference of Mayors. Retrieved February 18, 2010. ↑ "City of Evanston - Office of Sustainability > Warming". City of Evanston. Archived from the original on April 21, 2009. Retrieved February 18, 2010. ↑ "ECAP - Citizens for a Greener Evanston". Archived from the original on July 26, 2011. Retrieved February 18, 2010. ↑ "Evanston Wins National Award for Climate Protection". Central Street Neighbors Association. June 17, 2011. Retrieved June 17, 2011. ↑ "Houston (TX) and Evanston (IL) win First Place Honors for Local Climate Protection Efforts" (PDF). The United States Conference of Mayors. June 17, 2011. Retrieved June 17, 2011. ↑ "City of Evanston - Government - Boards, Commissions, and Committees". City of Evanston. Archived from the original on December 26, 2009. Retrieved February 18, 2010. ↑ "City of Evanston - Office of Sustainability". City of Evanston. Retrieved February 18, 2010. ↑ Wind Farm Coast Evanston – A Fresh Squeeze Archived May 2, 2010, at the Wayback Machine. ↑ Barrett, Joe (April 20, 2010). "Wind Farms Catch a Gust on Great Lakes". Wall Street Journal. Retrieved September 17, 2011. ↑ "Wind Project - Renewable Energy / City of Evanston". City of Evanston. Retrieved June 17, 2011. ↑ "Ford Building Achieves 'Green' Status". Northwestern University. January 11, 2006. Retrieved September 17, 2011. ↑ "JRC Awarded Platinum-Level LEED Certification". Jewish Reconstructionist Congregation. September 24, 2009. Retrieved September 17, 2011. ↑ "Citizens for a Greener Evanston". GreenerEvanston.org. Archived from the original on February 13, 2010. Retrieved February 18, 2010. ↑ "Business Alliance for a Sustainable Evanston". BaseEvanston.org. Retrieved April 30, 2010. "Evanston". Illinois State Gazetteer and Business Directory, for the Years 1864-5. Chicago: J.C.W. Bailey. 1864. OCLC 6867103. Barr, Mary (2014). Friends Disappear: The Battle for Racial Equality in Evanston. Wikimedia Commons has media related to Evanston, Illinois. "Evanston". Encyclopædia Britannica (11th ed.). 1911.